We all want to be the best versions of ourselves in all situations. We want to shine professionally, be #couplegoals, support our communities, have a movie star bod and feel like a million bucks too. Honor your body and mind as best you can. If you don't show respect for yourself and your health, how can you expect it from others? Get some sleep. I've said it before, and I'm glad that more and more research is showing just how incredibly important it is prioritize sleep. Try to stick to a consistent sleep/wake schedule. Finish eating 2-3 hours before bedtime. Avoid screens (blue light) after 7pm. If you want to get nerdy about it, get an Oura ring to help you measure what works and what doesn't work. Be kind to everyone, always ... but guard your time and energy. The governing text of yoga, the Yoga Sutras, suggests that we cultivate friendship and delight towards those who are happy and virtuous, compassion for those who are unhappy, and disengage with those who are harmful. Translation: just because you are home for the holidays does not mean you have to catch up with every "old friend" you have. Prioritize people who prioritize you - the true friends and family with whom you will have lifelong bonds. The people you surround yourself with have a real impact on your self-esteem, habits and world view. If someone triggers negative thoughts or feelings, tell them you're busy and move on. I am absolutely THRILLED to announce that I am joining Peloton as one of the premiere yoga instructors! My community is incredibly important to me, and I am SO excited that mine is growing. My heart is literally exploding because yoga + community mean so much to me and I CAN'T WAIT for you to come to class and get to be a part of it! Join me in-person for class at the new Peloton yoga studio at 152 Christopher Street. You can find my schedule HERE, and sign yourself up -- or feel free to email me if you'd like to try out a class as my guest. I miss you all and I would LOVE to see you in class. If you aren't in town, Peloton Digital is launching on 12/26, and you'll be able to take my classes LIVE along with me, or on-demand at your convenience. My very first live class is on 12/26 at 8:30am. The first 14 days on Peloton Digital are free - so download the app and join me! I grew up a tree climber, barefoot in my backyard with wild hair, trying not to dirty the frocks in which my mother would dress me. I am not a sit still kind of person; I love to move and I love yoga. But yoga is more than a form of movement. Yoga was presented in this way to me as I grew up — a methodology, not a fitness regime. My parents are of Indian origin, and we treated this healing art as something of interest, but not a practice. They were busy with work and life (and children), so once in a blue moon we would treat ourselves and have yoga teachers come to our home and teach us. These sessions were underwhelming for a 10-year-old me, full of long held postures, breath work, and sitting still. In these classes, as none of our family members were in need of specific healing, there was a greater focus on meditation. This was tough. I longed to run barefoot in the backyard, bike around the neighborhood, or get lost in a book — anything but sit quietly or try to count my breaths. Nonetheless a seed was planted: Yoga is a methodology for healing, and that these practices have properties beyond the postures, beyond the physical. My childhood and adolescence flew past me, as many of ours probably did. My parents spent a lot of time embedding us in Indian culture and philosophy, taking us to weekend courses to learn Eastern worldviews and religion (Jainism) and planning trips to India at least once a year. I spent a lot of time trying to be a better soccer player, keep up with my classes, and fit in with my friends at school. It wasn’t until college that yoga reappeared into my life in a significant way. I majored in mathematics, and although I thoroughly enjoyed the way that math stretches your brain, I struggled knowing that I didn’t want to pursue the career trajectory before me. Simultaneously I didn’t have the time to continue to play soccer, and my injuries were making even running inaccessible to me. My parents had retired and moved to India, so I couldn’t often go home to reassess. I felt stuck, physically, mentally, and emotionally. This is when the yoga seed that was planted in my childhood started to sprout. I suddenly began to wonder if these ancient healing techniques might be able to help me through my anxiety. So like every other 18-year-old at the time, I sought help from Google. I pulled up some Rodney Yee videos and perused Light on Yoga in search of the right combination of postures to help. I went down the Internet rabbit hole and for some reason became obsessed with David Swenson’s ashtanga primary series video and what he was saying about breathing and practice. So began the foundation of my vinyasa practice. If nothing else, yoga helped me create a deeper connection to myself. It kept me from tying my identity to the things that I did. It allowed me to recognize that I didn’t want to work in the finance industry after college, so I let myself stray from the life path I had set out for myself, and with nowhere else to turn to, went to my parents’ home in India. As it turns out, abandoning your life goals and moving to a different country can create a whole new world of anxiety. As I pondered the purpose of my life in Bangalore, I found the time to practice yoga 2-3 times a day. I would practice Mysore with a teacher and explore more on my own at home. As much as I enjoyed this time of self-reflection and growth, being unemployed wasn’t my end goal. So when new opportunities fell into my lap, I moved to Mumbai and began a 5-year career in fashion. Like a stable partner, yoga never left me — it was the one piece of my life that stayed constant from place to place, from job to job. While I was in India, I remember laughing when my mother told me to consider opening a studio and teaching. But as fashion wore away at me, I began to lean more on the practice, and study it more seriously. 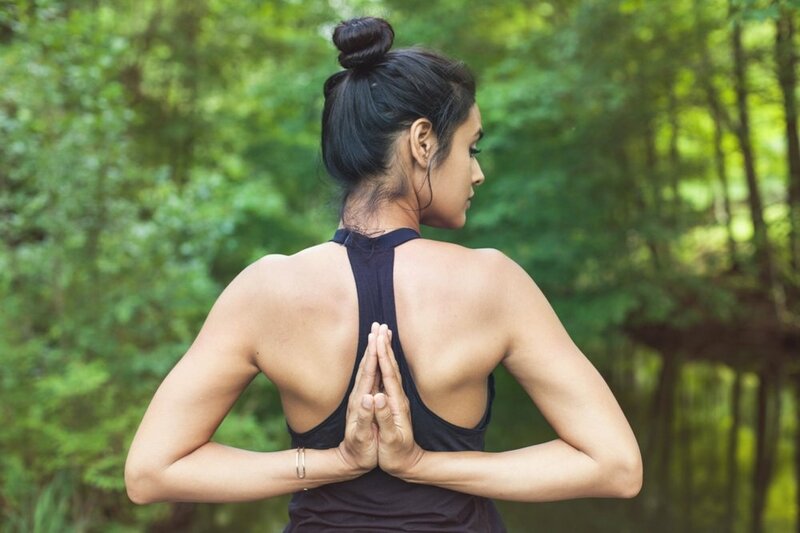 I noticed that yoga helped me to connect more deeply to a sense of self that wasn’t defined by my job or location or family. I was happier when I practiced, and the effects were so noticeable that if I were moody, my brothers would ask me if I had skipped yoga for the day. Fast forward to 4 years ago when I followed my heart and moved to New York City. Living in NYC without an income is incredibly motivating. I was laser focused on getting to know the yoga community and getting hired as a teacher. For the first time, I practiced with music. I learned how to assist others. I found teachers to learn from (thank you Nikki Costello, Robert Lindsey, and Lindsay Hilscher). I read everything I could get my hands on, I practiced religiously, and I studied history, philosophy, anatomy, and everything in between — and here I am today, a yoga teacher in NYC. Any practice, or art form can change your life. If you woke up at 5am and boxed for 2 hours every morning, surely that dedication would pay in scores mentally and emotionally. The effects of discipline and the self-reflection that comes from a sustained commitment is not to be overlooked. Yoga is an energetic practice, an experience that threads together the inner and outer selves. If you prescribe to the Yoga Sutras of Patanjali, the goals of yoga and the path to yoga are meditation. There are many approaches to the practice, but at the finish line is a steadiness of mind. There are other ways to use the tools of yoga as well. Restorative yoga, pranayama, pre- and postnatal and yin yoga are valid forms of yoga with countless health and wellness benefits. My personal practice is somewhat traditional, but it’s certainly not the only way. How can it be, when the world of yoga is evolving around us every day? Whatever worldview we as yogis prescribe to, I strongly feel that it is our responsibility to learn the history and philosophy behind the practice. Iyengar encouraged creativity, and brilliant new practitioners should and will continue to innovate the practice of yoga. I, for one, am excited to see how yoga takes on an even bigger presence in the world over the course of my lifetime. Nothing is impossible, just difficult. Nothing challenging comes easily or overnight.Daily perseverance is the key. There will always be somebody better, stronger, faster, more flexible than you, maybe even without putting in as much effort. Instead of being jealous/angry/bitter, the best thing to do is to respect their abilities/talent, and work harder on your own. Yoga makes you challenge yourself every day. I still feel all of these things, and more. I haven’t reached enlightenment, but I’ve certainly experienced some major positive changes beyond the obvious physical benefits. Yoga has allowed me to relate to myself and the world around me with more space. By observing without judgement, I can notice my emotions without being my emotions, and then see others in the same way. The space allows me to choose how to act (out of love) instead of react to the world. My mission as a teacher is to show others that a yoga practice is more than making space in your body; it is making space in your mind. One of the things that gives me great joy is cultivating a community around this sort of mindfulness. You can catch me and my good friend Sasha Nelson curating Mindful Morning events around the city, in which we meditate, discuss, and share nourishing food with like-minded individuals. Otherwise, follow my adventures on Instagram. I’m always interested in your thoughts, so please feel free to reach out! Originally published on Best Self Media. Originally recorded for the American Desis Podcast.